CIS/U Sports Men’s Basketball Final 8: Three-year pilot gone wrong? Failure or Success? With the CIS/ U Sports Men’s Basketball Final 8 Championships coming to a close, it’s time to examine whether the event was a success or failure. In my mind both the Carleton Ravens and ScotiaBank Place did a poor job of executing this event for the past 3 years. Let’s take a quick look at some of the notable mistakes and decisions that could’ve improved this tournament significantly. It would have been nice to actually see a marketing campaign for the Final 8 Men’s basketball championships. I understand not doing it in year one, but you got to learn from your mistakes. I mean, Halifax purchases billboards ads throughout the city, especially around the Metro centre. What did the Ravens and Scotiabank place do? They marketed internally on their respective websites; I’m sorry basketball fans don’t go to capitaltickets.ca to find basketball content. Enough said, most students have a hard time walking from their dorm rooms to their local gyms to support their school teams. What made you think that they would actually drive 45 minutes to watch teams from out of town? What about public transportation? What about a shuttle system? Who are you kidding, we can count too. I guess the people at ScotiaBank Place were the only ones who took general high school math. It looks really bad when your press release says that there were 12, 000 people in the building when really there was only about 6500-8000. I guess corporate sponsors like that kinda fluff. With ScotiaBank Place holding over 19000 seats, why not focus on filling up the lower bowls instead of having people scattered all-cross the arena? Did you ever think of bringing down an artist to entertain the crowd? Halifax was pretty creative with this, a few years back they had the announcement of the All-Canadians and awards winners during half-time of a game and they actually went all out and made it entertaining for the fans. I guess having the Milk Mascot around was enough. How do you go and partner up with a company like TSN/TSN2? They clearly have no understanding of Basketball in Canada? That’s the same company that locked out basketball/Raptors fans for a full year because they were more interested in getting subscribers. TSN is about hockey, not basketball!! Basketball is an urban sport, and correct me if I’m wrong, but, the only TV station that understands a lick of urban in this country is The Score. TSN/TSN2 doesn’t broadcast any games throughout the year and they hope that all of sudden people will gain interest because you decided to send Leo Rautins and Rod Black down for a weekend? The Score starts showing NCAA basketball games around late January for a reason. Build a following throughout the season as an appetizer to the championships. It will be interesting to see audience ratings in comparison to The Score. It’s the end of an era at Carleton. The school has announced that Dave Smart, who built a dynasty that dominated Canadian university sport for nearly 20 years, has stepped down. Smart has accepted a new role as the university’s director of basketball operations, Carleton said in a news release. He will be responsible for “developing the men’s and women’s basketball programs and continuing to build a culture of sport excellence,” the release said. “Smart will provide operational support, mentorship and technical leadership to the coaching staff of both programs, and he will work with the Department of University Advancement in fundraising and community development. Taffe Charles, who coached Carleton’s women’s program for 12 years and won a national title in 2017-18 will succeed Smart as men’s team head coach. “It’s been a great run,’’ said Smart in a statement. “Coaching is my second love, my first being my wife and children. I am very thankful to the university and I am looking forward to my new role. Smart’s 19-year tenure at Carleton was one of remarkable dominance, with 14 national championships. He also won a record number of coaching awards and has been active as a coach with Canada Basketball. “Dave’s success on the court has given Carleton great national visibility and we are sincerely grateful,” said Benoit-Antoine Bacon, president of Carleton University. 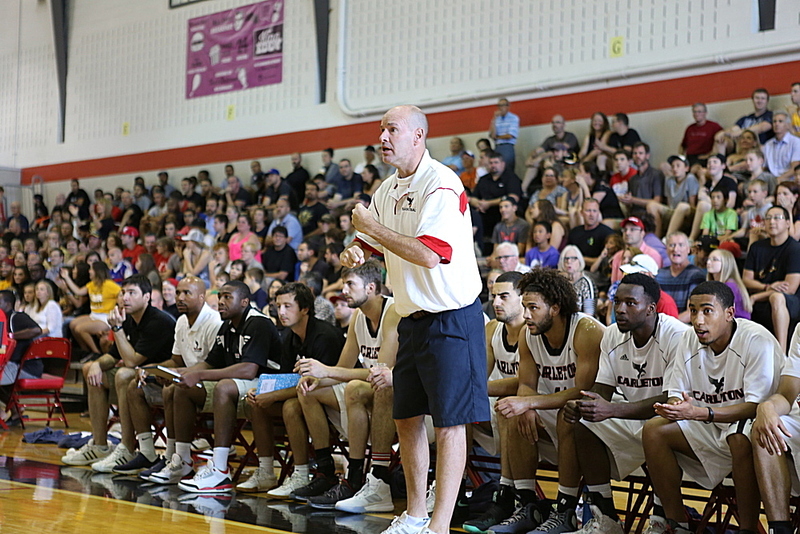 Charles played on Carleton’s men’s team from 1990 to 1995 and began his coaching career as an assistant in 1995; he then served as an assistant with the men’s program from 1998 to 2007. Since returning to the women’s program in 2007, Carleton won four U Sports Final 8 berths, four OUA East titles, and two OUA championships. Carleton’s women’s national championship in 2018 was the first in school history. “I am truly honoured to be entrusted as the next head coach of the Carleton University men’s basketball program,’’ said Charles in a statement. Carleton said it has launched a national search for a head coach of its women’s program. Laurentian guard Kadre Gray took his game to another level this season. A year ago, Gray was the top Canadian university male athlete in any sport, the first Laurentian student to win the honour. He led the country in assists, narrowly missed a scoring title, and — perhaps by default — also won the Mike Moser Memorial Trophy as men’s basketball player of the year. “Kadre’s work ethic continues to shine bright,” said Laurentian head coach Shawn Swords in a statement. If there was any doubt, Gray stifled it in his junior season. He averaged 31 points, 7.4 rebounds and 6.2 assists per game en route to his second consecutive Moser trophy. “It’s an amazing accomplishment to do it once,” said Swords. “And now, to be named MVP twice, is truly a testament to his willingness to learn and improve. Gray received the 2019 Moser trophy Thursday at a gala in Halifax, N.S., ahead of the U Sports Men’s Final 8 tournament. University of Calgary guard Mambi Diawara, Concordia guard Ricardo Monge and St. Mary’s University guard Kemar Alleyne were also finalists for the award. Gray was simply a cut above. He posted gaudy stats with notable efficiency, shooting 48.8 per cent from the floor. He was also a First Team All-Canadian and played with Canada’s national team in FIBA World Cup 2019 Americas Qualifiers against Venezuela and Brazil. Gray was the only U Sports player to participate in the qualifiers. Rookie of the Year (Dr. Peter Mullins Trophy): Alix Lochard, UQAM. Ken Shields Award for Student-Athlete Community Service: Tanner Graham, Queen’s. Defensive Player of the Year: Marcus Anderson, Carleton. Stuart W. Aberdeen Memorial Trophy (Coach of the Year): Dan Vanhooren, Calgary.